Gyms are great for a lot of people. Some people like all the equipment available. The motivation provided by the people around them helps drive others. There are some people who use the gym as place to get away from everything and concentrate on gaining muscle mass. But that does not mean the gym is for everyone. There are a lot of people who aren't working out in gyms, for a variety of reasons; the cost may not be practical, you may not have the time, or you may not be comfortable working out in a fishbowl. 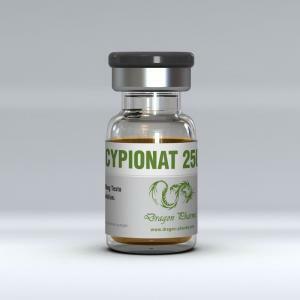 No matter your reasons they can all be overcome while still gaining muscle mass at home. One of the downsides of training at home is that you won't have all the equipment available at the gym. Don't let that bother you. People have gotten real results from home equipment. You can too. If you can afford all the equipment you need that is great. If you can't there are always alternatives. I have heard of coffee tables used as flat benches, and kitchen chairs as the place to do shoulder presses. The bottom line is there is almost always a way to work out. Remember though, no amount of muscle is worth an injury. If you can't do an exercise safely, then don't do it. Often times the safety issues can be addressed by having another person or even two there to spot for you and help lift weights into awkward starting positions. 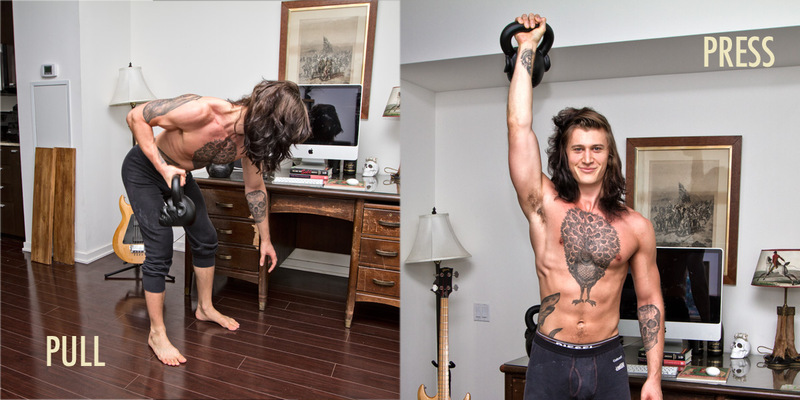 One of the best ways to work out at home is using dumbbells. They can be easily dropped to your sides if you reach a fail point in your lifting. 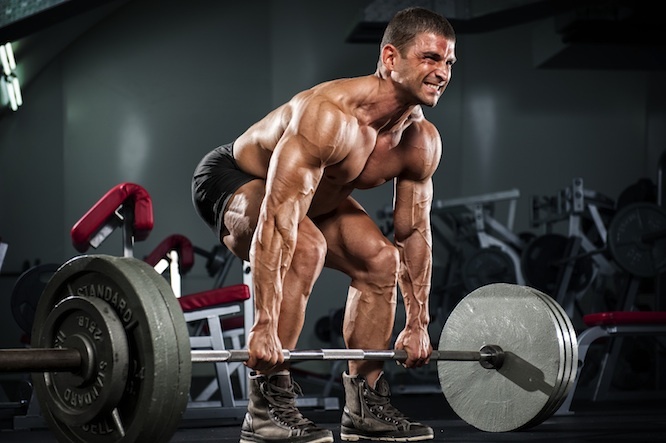 They are also a lot easier to get into a good starting position than a barbell. Push-ups - These are a stand-by of most home workout routines. They are perfect for building muscle. They can also be adjusted into an infinite amount of positions. In order to change the portion of the muscle that is being worked you can move your hands closer together or farther apart. You can also change the angle that you work from by elevating your feet on a chair, a step, or even a coffee table. Curls - Hope fully you have dumbbells, if you do not you can use anything that can be held securely in your hand. Even a filled grocery bag. By keeping your elbows close to your side, you can curl from your hip up to a spot directly in front of your shoulder. 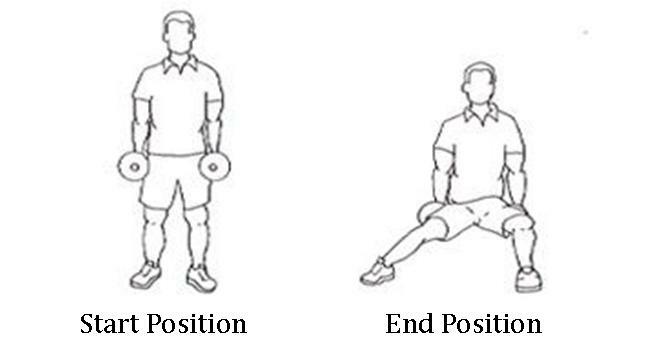 Tricep Press - Place a chair 3-4 feet in front of you and hold the top of the chair-back with both hands. Your body should be leaning at a 50°-60° angle with your arms against your chess. Press yourself up from the chair-back by straightening your arms. The intensity of this exercise can be adjusted by how far over you are leaning in order to reach the chair. Lunges – You can use a set of dumbbells to do lunges in your house. You can either do them in place or if you have enough room like a hallway, you can do them walking. Hold the dumbbells down by your waist as you lunge in place or a walking lunge. Calf raises - These are one of the easier exercises to do at home. Sitting in a chair, with your feet on a block, place your free weights on top of a board laid across your knees. You can now perform the calf raises against the weight that is resting on your legs. There are limits to the amount of wweight training you can do at home. But the weight training you do at home is a lot more effective than anything else you choose to do at home. Until you are comfortable or able to go to a gym, building muscle at home is the best option. Remember that the same things apply at home that would apply at a gym. Always warm up and cool down. Never put yourself or others into danger with risky exercises. In order to get the kind of muscle mass results you are looking for you are going to have to lift rigorously, several times a week. Because it is likely that you will break your routine into upper body and lower body, we have separated our articles the same way. The following exercises can all be done together and are great for adding muscle mass to your legs. Positioning - Place your feet slightly wider than shoulder width. The weights should be resting on the ground with the bar crossing over the balls of your feet. Squat down, keeping your eyes forward and your back straight. Grasp the bar just slightly wider than your feet. The Lift - Keeping your back rigid and arms straight and unbent, raise the bar by extending the knees and hips. The power from this exercise should come from your legs not from your back. Bending your back can lead to herniated discs. Once you have reached the upright position complete the lift by raising your shoulders. Down Phase - With the same pacing and control you used to lift the bar, return it to the starting position by lowering your body from the knees and hips. 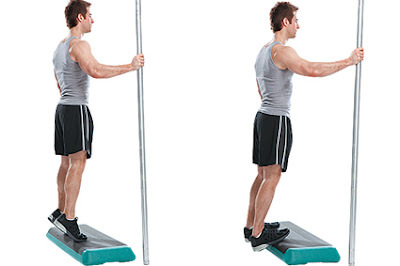 Positioning - The bar should be should rest on the rack 3 inches lower than the top of the trapezius muscle. You should stand backed up to the bar. Feet should be slightly wider than shoulder width. Hands should be placed evenly on the bar. Down Phase - Stand up into the bar, holding it steady across the trapezius. Slowly lower your body be bending at the knees and hips. You should always keep your eyes forward and your torso rigid. The tendency to look the direction you are moving can lead to falling, either forward or backward while lifting. The Press - Once you have reached the bottom of your knee bend, extend your hips and knees and rise to the fully erect position. Exhale throughout this portion of the movement. Make sure that you maintain control of the bar as you reach the end of your motion. Positioning - Stand with one foot forward and the other back. The distance between the two should be a little longer than your natural stride. Make sure that the position of your front knee is directly above your front foot. In order to get great muscle mass gains you should have a dumbbell in each hand. Down Phase - Slowly lower your rear knee to the floor by bending your front knee. Keep your Head up and your eyes forward. This will prevent leaning forward. Recovery - Squeeze you buttocks tightly and rise by straightening both legs. Use your abdominals and lower back to maintain your upper body's position. Positioning - This is done on a machine. Sit flat against the chair back, placing your feet firmly on the footpad. Feet should be slightly wider than shoulder width. In the starting position your legs should be bent just past 90°. The Press - Using your heels as the pressure point (not the balls of your feet), extend your legs to the point just before they lock. Down Phase - Lower the weight at a controlled pace until you are back to your original starting position. 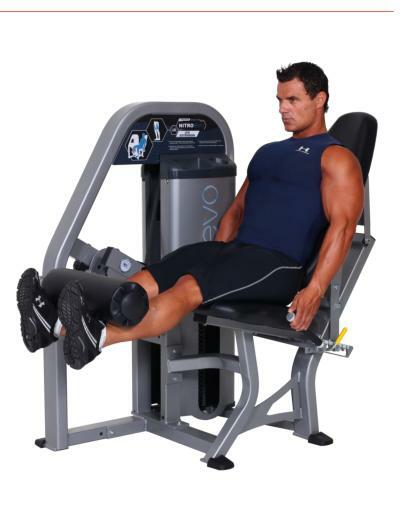 Positioning - Place your feet firmly on either the base of a calf raise machine or place your toes on the edge of your calf raise block. If you are using a machine then place your shoulders against the pads of the machine. If you are using dumbells make sure that you have them secure in each hand. The Raise - The only motion should be at the ankle. By pressing down on the balls of your feet you can extend your entire body upwards. Do not bend you knee. Down Phase - Lower yourself at a controlled pace until the heels of your feet are slightly off the ground. 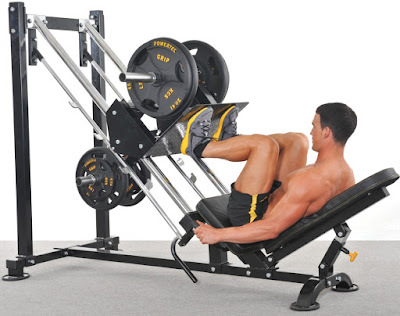 Positioning - This is done on a leg curl machine. Seated on the chair of the machine your legs go over the top padded bar. This bar should rest behind your knees. Your feet then tuck in behind a lower padded bar. This bar will cross in front of your ankles. Make sure that this pad is just above where your shin meets your foot. The higher that this pad is the shorter you are moving the weight, cheating yourself out muscle mass. The Extension - Raise the bar by extending your leg in a kicking motion The lift should continue until your calves are parallel to the floor but not so far that you lock your knees. Down Phase - Lower the weight at a controlled pace until your knees are again bent to the original 90 degree position.